This 35 Hour CET is held part-time over the course of 3 weeks. Please note the following schedule. Another 5 hours of non-contact hours will be of self practice, which will be discussed on the first day of the program. All students will be encouraged to present one mantra of their choice, explain it and teach the class how to chant it on Friday May 3. Upon completion of the program, a Continuing Education for Teachers (CET) certificate will be awarded to you. Please email nora@thinkoffthemat.com for tuition fee and payment details. Thank you! 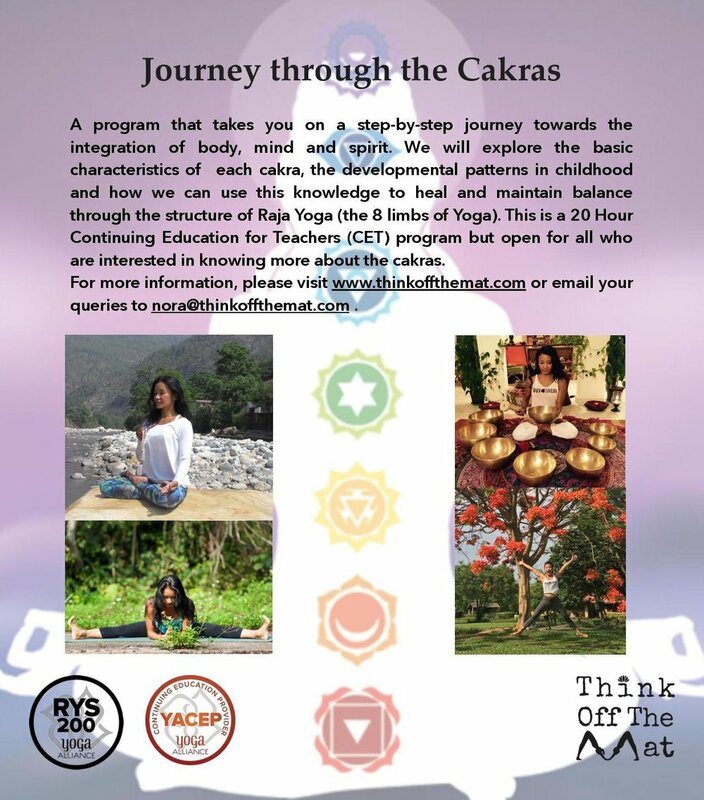 This program is open to all who wish to integrate the practices of nada, yogāsana, pranayama and dhyana with the knowledge of cakras into practical relevance within our daily lives. A certificate of completion will be provided upon satisfactory attendance. For more information, please visit www.yogaroomhk.com. This training is accredited with the Yoga Alliance (https://www.yogaalliance.org) and to adhere to the Yoga Alliance requirements, the training will consist of a minimum of 180 contact hours with me. The remaining 20 hours will be spent on home assignments and self practice. Contact hours refer to the hours that will be spent with me in the following areas in a group class setting. Topics in this category could include, but are not limited to: asanas, pranayama, kriya, chanting, mantra, meditation, Sanskrit and other traditional yoga techniques. These hours will be a mix between: 1) analytical training in how to teach and practice the techniques, and 2) guided practice of the techniques themselves. Both areas will receive substantial emphasis. *Special Requirements: A minimum of five of the above hours will be spent applying anatomy and physiology principles to yoga. *Special Requirements: A minimum of 2 of the above Contact Hours will be spent on ethics for yoga teachers. 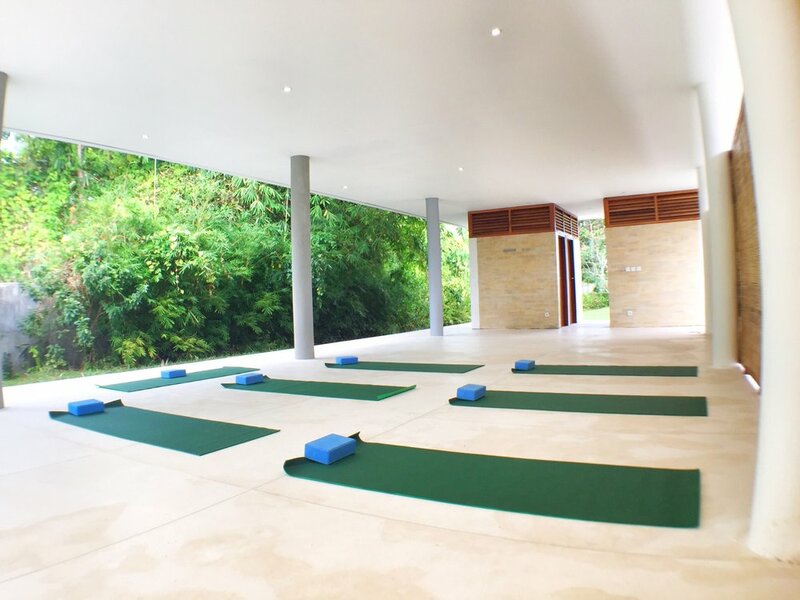 *Each trainee will spend a minimum of 5 Contact Hours actively practice teaching as the lead instructor. Time spent assisting, observing others teaching, or giving feedback to others is excluded from these hours. **Trainees will teach a full 90 minute Yogāsana class which will include breathwork and meditation as part of the final practicum. This is a part-time non residential course with a full week residential in Goa for practicum week at the end of the training. Students are welcome to invite friends and family to the practicum week and attend the classes lead by all trainees. Please contact me at nora@thinkoffthemat.com for more information. 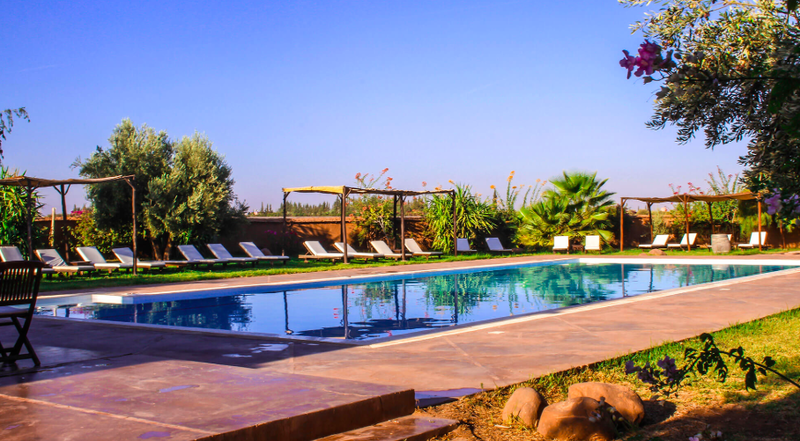 Travel to the mystical land of Morocco with me for a week of Bhakti (Devotion) Yoga. Our practice of devotion simply means “to be one with”, through Faith (Śraddha), something much bigger than our limited individual selves. To be one with our highest Self, to be one with the Divine. Through the Yoga practices of Āsana (postures in Hatha/Vinyasa/Yin/Restorative Yoga) to prepare and purify the physical body; Pranayama (Breath work) to discipline and free the subtle body, Śastra (Yoga philosophy) and Dhyana (Meditation) to quieten the mind and contemplate on what it means to be one with the infinite ocean of Divine consciousness, and Nada (Sound - Mantra and Kirtan) to further open our hearts and minds in realisation that we are one with the Divine and all Divine beings in this realm. 5 to 6 hours of Yoga practices - Morning practice of 2.5 to 3 hours / Evening practice of 1.5 to 2 hours / After dinner meditation/mantra/restorative of 1 to 1.5 hours. Flights (There are numerous flights flying into the Marrakech Menara Airport from major cities in Europe and middle east. I am happy to recommend airlines and flights if you need assistance. Additional food and drinks not included in the 3 meals provided. For further queries and clarification, please do not hesitate to reach out to me at nora@thinkoffthemat.com. Flying into Paro is one of the most spectacular flights one can experience. While descending into Paro valley, on a clear day sky you will be greeted by the world’s highest peaks, including Everest. The flight during autumn is absolutely beautiful. As the flight gets closer to the only international airport in Bhutan, you will see the Paro Dzong(fortress) on the hillside overlooking Paro valley, with Ta Dzong, which now is the National Museum. Upon your arrival, we will drive to Thimphu, the capital of Bhutan. The first stop will allow you to view the magnificent Tacho Lhakhang, The hereditary place of worship for Bhutan’s Iron Bridge Builder. After the visit we drive further to reach Chuzom, the confluence of Paro Chu (River) and Wang Chu (Thimphu Chu) after crossing Chuzom we enter Thimphu valley and drive up to Kuenselphodrang (Giant Bronze Buddha Statue). Buddha Dordenma is a gigantic Shakyamuni Buddha statue under construction in the mountains of Bhutan. The statue will house over one lakh (one hundred thousand) smaller Buddha statues, each of which, like the Buddha Dordenma itself, will be made of bronze and gilded in gold. The Buddha Dordenma is sited amidst the ruins of Kuensel Phodrang, the palace of Sherab Wangchuck, the thirteenth Desi Druk, overlooking the southern approach to Thimphu. We will head to the hotel for a grounding, post-travel Yoga practice with chakra healing sound bowls and chakra meditation. After dinner, choose to either rest or stroll the night market. After breakfast , visit Pangri Zampa, dyllically located in the middle of a meadow, not far from the river, a 20-minute drive from the lodge on the way to Tango and Cheri monasteries. The temple appeared in Zhabdrung Ngawang Namgyal’s vision which directed him from Tibet to Bhutan. 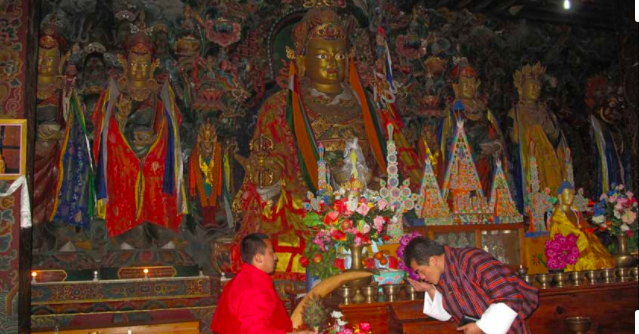 The temple was built by Ngawang Choegyel, the great-grandfather of the Zhabdrung, and was the Zhabdrung’s residence when he arrived in Bhutan in 1616. Today, the temple is used as an astrologer's centre of the state clergy, and is the home to around 100 monks studying astrology. During a visit Pangri Zampa you can learn more about astrology, and also have your personal reading done. Tango Hike - Tango is a beautiful temple, which is easy to reach. The hike all the way up to Tango Dzongkha, a meditation retreat, is more challenging but will reward you with great views over Thimphu and Punakha valleys on clear days. Cheri Hike - Cheri Monastery is located 15 km drive north of Thimphu Valley. From a point you need to hike uphill of nearly 30-45 minutes. You need to cross an old traditional bridge made of wood and stones. Cheri Monastery was established in 1620 by Zhabdrung Ngawang Namgyal(The founder of Bhutan). The monastery is now a major teaching and retreat center of the Southern Drukpa Kagyu sect. The Monastery serves as the monastic school for study of Buddhist Philosophy, metaphysics, mathematics, poets and many other Buddhist studies. Head back to the hotel for evening Yin and Restorative Yoga followed by dinner. Optional after dinner Satsang - Daily reflection, mantra Yoga (chanting), meditation and aarti - sacred light offering. After breakfast, our journey continues as we head towards Punakha at 1300 m and a warmer region. Punakha is one of the richest agricultural lands and is blessed with one of the biggest rivers in the country. En-route we will cross over Dochula pass at 3050 meters, and view the most dramatic panoramic view of the greater Himalayas. The Dochula landmark is the Wangyel Chortens – 108 stupas built on the mountaintop in a Mandala pattern, further enhances the beauty and tranquility of the pass. From this cooler mountain pass we will descend into a warmer region of Punakha. While we enter Punakha valley, we will stop for a visit at Chimmi Lhakhang the auspicious fertility temple, dedicated to the Tantric Buddhist Master Drukpa Kinley (Divine Madman). Depending on the season, one gets a glimpse of rural farming life and the rural architecture, decorated with beautifully painted motifs and patterns. After breakfast, we will travel up the valley north and cross the Mo Chu to hike up and pay respects to the grand Khamsum Yuelley Namgyal Chorten, The Chorten is 30 meters (100 feet) tall and can be seen in the distance when driving.The three-levelled chorten took eight and a half years to build and was consecrated in 1999. Dedicated to the Fifth King, it was built to remove negative forces and to provide peace, stability, and harmony in an ever- changing world. It is therefore filled with every form of colorful protector imaginable. After the hike we will have a picnic lunch followed by a visit to the Sangchhen Dorji Lhendrup Lhakhang Nunnery and explore the beautiful statues of Avalokiteshvara, Gautama Buddha – the nunnery also acts as a centre of meditation. Head back to the hotel for evening Yin/Restorative Yoga with healing sound bowls and Aarti followed by dinner. No evening satsang today. After breakfast, the journey west takes us back to Paro valley following through Wang Chhu and Pa Chhu rivers. After a brief orientation tour of Paro’s main features, we enjoy a late lunch at a local Paro restaurant before checking in at the Hotel. Great day to check out the hotel's facilities and spa offerings. After dinner Satsang - Daily reflection, mantra Yoga (chanting), meditation and aarti - sacred light offering. Paro Cultural Tour should always start with a casual browse through the National Museum, housed in the Ta Dzong (Watch Tower) of the Rinpung Dzong. In the Museum the intriguing collection of artifact serves as a great introduction to the rich culture and heritage of the Kingdom. The National Museum boasts a rich variety of exhibits collected from all over the country and belonging to different eras, some as early as 2000 B.C. A visit through the galleries shows the country’s transition from the later Stone Age to a modern Mahayana Buddhist kingdom. We will then stroll down to the Paro Dzong and take in the amazing architecture of this 17th century monument, a premier example of Bhutan's architecture. This fine example of Bhutanese architecture now serves as a central monastic and administrative seat of the Paro district. From the Dzong, a leisurely walk back into Paro town crosses the scenic Nyamai zampa, a unique model of Bhutan's traditional cantilever bridge. Restorative Yoga with chakra healing sound bowls followed by dinner. No evening satsang today. After breakfast you will visit the auspicious Kyichu Lhakhang, a scared monument pinning down the left foot of a treacherous ogress, which is built in 659 A.D by the Tibetan king Srongsen Gampo. This Monastery is one of the 108 monasteries built across the Himalayan region by the Tibetan King to subdue the Demoness that lay across the Himalayan region. After this experience, we take a leisurely stroll in the town, visiting shops for some retail therapy. After dinner Satsang - Kirtan (devotional chanting) and aarti - sacred light offering. We save the best for last! After breakfast, we continue to explore Paro valley with a hike to Taktsang - Tigers Nest monastery (4-5hrs hike). Tigers Nest or Taktshang Goempa is one of Bhutan's most revered monuments. It literally hangs off the face of a cliff 900 meters (2952 feet) above the valley floor. The legend states that Guru Rinpoche flew into Bhutan on a mythical tigress and meditated in a cave before bringing Buddhism to Bhutan. The four-hour round trip hike offers spectacular views of the Goempa and the valley below. We end our Bhutan journey with a beautiful guided meditation at Tigers Nest Monastery. 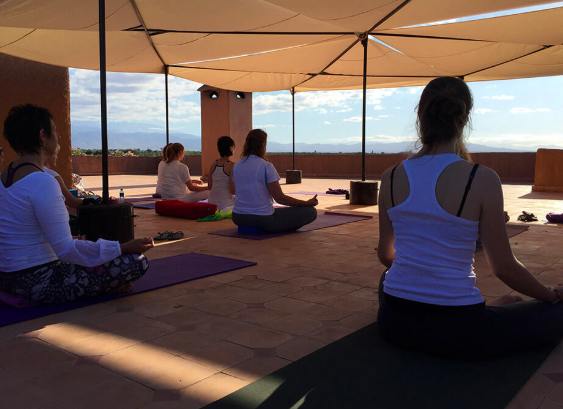 We return to the hotel for an evening of Restorative Yoga with chakra healing sound bowls followed by dinner. After breakfast, an early morning transfer to Paro Airport for your onward flight. All internal Taxes (10%) and service charges (10%). Government royalty $ 65 per day per person. All Bhutan accommodation in tourist 4* grade Hotel approved by the Tourism Council of Bhutan. All meals - 3 meals a day. Service of professional and a licensed English speaking guide. Complimentary mineral or bottled drinking water throughout the trip. All permits and museum entry fees throughout the trip. Complimentary Culture Show at the farewell dinner. Accommodation in Bangkok or New Delhi if necessary. YOGIS ARE ADVISED TO BRING THEIR PERSONAL MAGIC MATS. THERE WILL BE SOME PROPS AT THE YOGA SHALAS AT THE HOTELS. * All inbound flights to Paro on Druk Air. Please provide your full name so I may reserve your inbound flights to Paro either from Bangkok or New Delhi ASAP as October is considered peak tourist season. Payment of Paro inbound flight will be advised accordingly. All yogis are responsible for their inbound flights either to Bangkok or New Delhi. Please note the departure times for the Paro inbound flights below and ensure that you give yourself sufficient time for your flight. More details to follow soon. Watch this space! Peace prayer to lead us from untruth to truth, darkness to light, and death to immortality. Join us on Wednesday evening May 23rd for a special evening of chanting to support Kirtan Wallah Foundation. 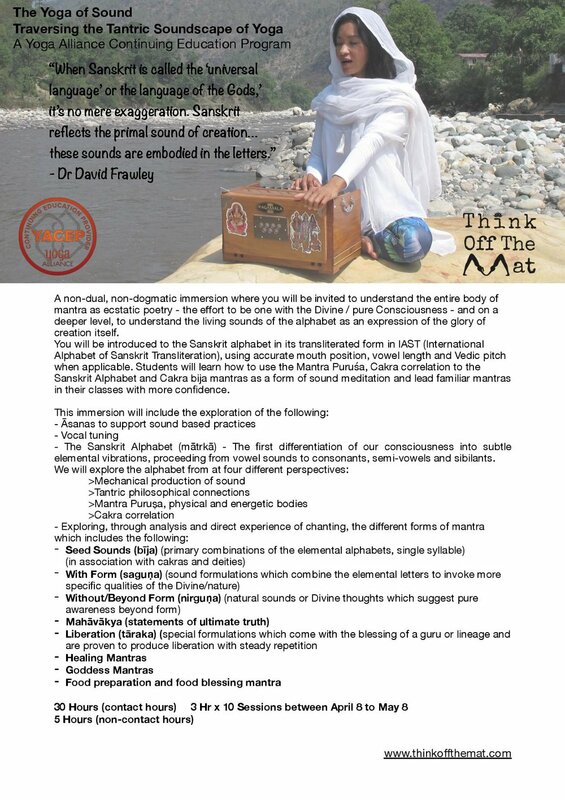 I will lead the chanting and play the tanpura and Judy Law will play the harmonium. Krishna Das is a world famous American vocalist that travels the world sharing his kirtan practice and discusses bringing chanting into our lives through retreats and workshops. With a remarkably soulful voice that touches the deepest chord in even the most casual listener, Krishna Das has been called yoga’s “rock star.” He has released 15 well received albums and has become a worldwide icon and the best-selling western chant artist of all time. 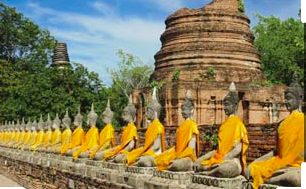 The Maha Mrtyunjaya is a chant that helps us overcome fear. We live in a world where many of us have certain fears that may limit us in the way we live. Fear of the unknown, fear of inadequacy, fear of failure, fear of getting hurt, fear of death... just to name a few - these fears limit us in opening ourselves to new experiences and can be so instinctual, it is difficult to overcome. The physical body and its physiology may change because of these fears and limitations - our physical, psychological and spiritual health is undoubtedly intertwined. Join Nora as we retreat to the beautiful island of Koh Samui where will will explore liberating ourselves from these fears through the practice of asana, mantra and meditation. “In the yogic tradition, the human body has seven energy centers called chakras. When these energy centers are healthy and open, so are we – physically, emotionally, and in our relationships. But when they are blocked through injury, illness, or disconnection from others, we are blocked from being our best selves. Rooted in ancient teachings, Chakra Yoga is more relevant today than ever. At a time when many people feel disconnected from themselves and others, it can heal your body and free your heart to move into the future with joy.” Sharon Gannon, Jivamukti co-founder. We will explore the different chakras and their significance in our physical, mental and spiritual bodies. Students will be guided through poses, affirmations and mantras (simple chants) and meditation that open and balance the chakras. There are two parts to the practice – a yang and a yin practice. The yin practice will consist of using healing chakra bowls to tune our chakras. This is a complete mind-body-spirit practice. Our energy flowers and our life force flows. We will feel a new sense of happiness, peace, and wholeness. Backbends are associated with the future and the unknown. One obstacle to backbending is the fear of falling – falling into the unknown – which is actually the fear of death – abhinivesa. This fear limits us in opening ourselves to new experiences and can be so instinctual, it is difficult to overcome. Fear is a safety measure that alerts us to danger and triggers physiological reactions designed to protect us. Fear causes the hip flexor muscle, our psoas, to contract, closing the front of the body and protecting our internal organs physically and our hearts emotionally. When fear becomes habitual, the psoas loses flexibility and makes bending backward scary and difficult. When we practice backbends intelligently and regularly over time, the psoas lenghtens and our hearts open, releasing negative emotions and we experience less fear. Backbends also stimulate the thymus gland, which plays a significant role in our immune system that can be suppressed when we dwell in dark, fearful emotions. Our physical, psychological and spiritual health is undoubtedly intertwined. We will explore how to safely open our physical and emotional bodies in this beautiful heart opening class and face the unknown future fearlessly. The Bhagavad Gita, "The Song of the Lord" is the timeless Indian spiritual classic that is integral reading for any Yoga student and teacher. It is set against a backdrop of a battle field where the warrior Arjuna, guided by Lord Krishna, navigates through the battle within himself. The Gita is as relevant today as it was more than 2000 years ago - Gandhi refers to this sacred literature as his “spiritual dictionary”. We will explore how to apply and practice the teachings of the Gita on and off the mat through asana, mantra, lectures and discussions. We will explore the major themes of the Gita. We will look at basic Sanskrit to enhance our understanding and chanting of important verses in the Gita. Why is Action a Necessary Part of the Path to Liberation? We start with a yang asana practice and followed by looking at how we can incorporate Karma yoga into our daily practice through a lecture and discussion. Wisdom in the context of Yoga is so much more than just collecting information, it is the wisdom that comes from knowing the Self. A slower Yin practice will lead us through ways to tap into that inner wisdom followed by a lecture and discussion. Faith and total surrender to the Divine are considered to be important aspects of Bhakti Yoga. We start with a Yang asana practice followed by kirtan (devotional singing) and a discussion on how we can bring in the devotional aspect into our daily practice. Krishna named it the Royal Path because it was practised by great kings (raja) in ancient times. Some of us might be familiar with this as Patanjali systemised it in the Yoga Sutras. We will start with a lecture and move into a Yin practice followed by meditation and conclude the session with a discussion and Q&A. We will practice the Mantra Purusha followed by chanting essential verses of the Bhagavad Gita and end this session with meditation. Please visit http://yogaroomhk.com/event/bhagavad-gita-daily-practice-off-mat/ for more details. Please visit http://www.yangonyogahouse.com/inner-vibrations-bago for more details. I'll be leading some workshops and classes at The Yangon Yoga House in February! Watch this space for my schedule. Patanjali's Kriya Yoga aims to neutralise the causes of sorrow that are rooted in ignorance and lead us to self-realisation. It consists of three aspects: Tapas or self-discipline (physical body), Svadhyaya or self-study (the mind), and Ishvara pranidhana or devotion to the Divine (the spirit). I invite you to join me amidst the beautiful surroundings of Origin Resorts, Lombok, Indonesia in an exploration to awaken from ignorance to bliss. 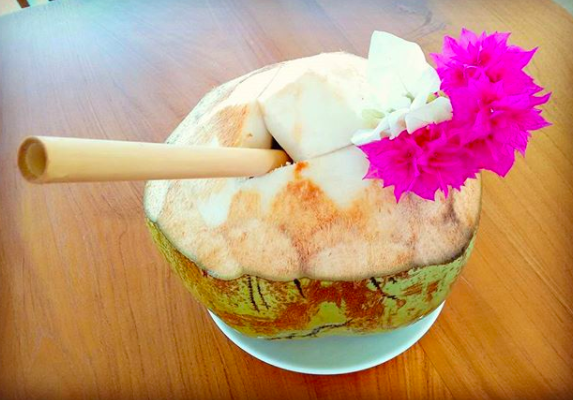 We start our day with pranayama, meditation and a "rise and shine" asana practice followed by a light breakfast. We move on to a more invigorating practice with insightful Yoga philosophy in the late morning before we break for lunch. Afternoons are at your own leisure and pace where you can choose to either take it real easy and indulge at the spa or kick in to a higher gear on the water surfing, stand-up paddle boarding or hiking. The evening Yin and restorative practice will seek to balance out the Yang in all of us and restore our spirit. Our evening Satsang (a gathering of likeminded souls in search of light and truth) together after dinner nourishes the soul with Kirtan (devotional chanting), viewing of the Jivamukti movie "What Is Real", Yoga Nidra (the art of Yogic sleep) and our guest teacher, Patricia Chiu will lead us in two Dynamic Dance Meditation sessions. Patricia will also be leading us in a Journaling workshop and guided journaling sessions where we have the opportunity to explore the myriad of ways we can keep journals and how it can potentially serve as a catalyst to assist us in our journey of self-discovery from ignorance to bliss. Our guest facilitator, Patricia is an avid believer that yoga can be a catalyst to living a fulfilling life, one that embraces harmony between mind, body and spirit. Having practiced yoga on and off for 10 years, she became a certified yoga instructor in the summer of 2011. In addition to being a former national hockey player for Hong Kong, Patricia is also a professional dancer and choreographer, giving her a unique insight and appreciation for the importance of developing a balance in both strength and flexibility. Passionate about giving back to the community, she has dedicated several years to community work with the Hong Kong Youth Arts Foundation, as well as dance/yoga/football projects in Cambodia and Laos. She strongly believes that sports and the arts can provide a platform for people to empower themselves as well as provide a medium through which social change can be instigated. She is dedicated to creating engaging and evocative experiences for all; experiences that strengthen the bodies, stimulate the minds, awaken the hearts and feed the souls. *All yogis are advised to arrive and check in on Sunday Dec 17th. Accommodation for Sunday Dec 17th is included in the cost (Meals are NOT included on Sunday Dec 17th.) Check out is on Saturday Dec 23rd and breakfast is included on that day. *Reservations are confirmed only upon full payment and verification of flight details. • No refund or credit will be issued for cancellations starting from November 1 2017. • A 10% package price administration fee applies to all refunds or cancellations. Bali to Lombok by Air - Flight time is about 30 minutes and start from USD35 one way. Garuda Airlines has direct flight between Lombok and Bali everyday. Padang Bai Harbour, Bali, provides the sea link between mainland Bali and Lombok. Buy tickets directly from the harbours or use a reputable tour company to provide a transfer service. Public ferries depart every hour for the sea voyage between Padang Bai Harbour Bali and Lembar Harbour Lombok. The crossing between the islands one way costs about USD4 and takes approximately 4 to 5 hours. Fast Boats - Speed boats from Bali to Lombok, which takes approximately 2 hours. Lombok International Airport and Bali Ngurah Rai (Denpasar) Airport has full Visa on Arrival (VOA) facilities. There are different rules for different foreign visitors to Indonesia. Most countries get a free 30 day visa while other countries need to apply for a visa before travelling. Please visit www.imigrasi.go.id to confirm your visa status, which is dependent on the passport you carry. Travel Insurance is NOT included in the package, therefore all yogis are advised to arrange your own travel insurance. For information on payment details and further enquiries, please email nora@thinkoffthemat.com - Thank you! I will be teaching at The Covelong Point Surf, Music and Yoga Festival alongside many other amazing Yoga teachers. Do check it out!